The period after "The Apocalypse War" had been consistently fertile for Judge Dredd stories--John Wagner and Alan Grant had been able to wring a lot of interesting story premises out of the post-war setting--and "Necropolis" seemed at first like it was going to be an opportunity for Wagner to get a few years' worth of juice out of changing the series' ground rules again. The first couple of post-"Necropolis" stories indicated that he was still treating the series as one big serial, and playing with the consequences of a natural (and political) disaster rather than the aftermath of a war. (McGruder's memorial speech in the first episode of "Nightmares" is a particularly sharp piece of black comedy.) Where a few months earlier Wagner had been hinting at ending the series, or at least his run, now he was hinting that he had long-term plans again. 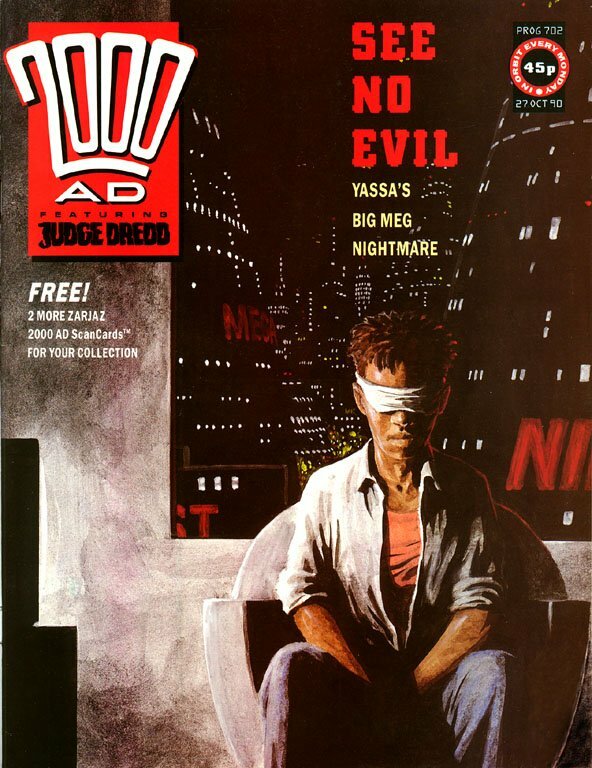 So Prog 711 had a shock in it: the opening episode of "Death Aid," the first Dredd story in 2000 AD written by anyone other than Wagner or Grant since the end of "The Blood of Satanus" more than ten years earlier. Garth Ennis, then 20 years old, was very much the new kid: he'd published only a few comics stories (Troubled Souls and True Faith in Crisis, a goofy serial called Time Flies in 2000 AD, and the first few chapters of his "Chopper" story, and that was about it), and all of a sudden he'd been handed the keys to the Cadillac. He immediately floored the gas pedal. Whether by design or happenstance, Grant's solo Dredd stories (and the very few that had appeared by other writers elsewhere) had avoided doing much with the supporting cast and subplots that Wagner had been setting up. Ennis jumps right into it: not only does "Death Aid" pick up on the Hunters' Club material that had appeared six years earlier, but by the second chapter he's grabbed the Yassa Povey subplot from "Nightmares" and is running with it, and the next week he brings back McGruder (and Wagner's running gag about her referring to herself in the first person plural). By the time Blondel Dupre shows up, it's clear that this isn't going to be a terribly radical change in direction. You can tell that Ennis is trying very hard to make the transition from Wagner's writing to his own smooth--there's a song parody on the third page, for Grud's sake--although there are occasional hints of the voice he was already developing elsewhere, most notably his fascination with dismemberment. Not everything about Ennis's first storyline went smoothly, though: the sixth episode ran four weeks after the fifth, with three unusually filler-y one-offs (all written by Wagner) in the meantime, billed as "Death Aid interludes." 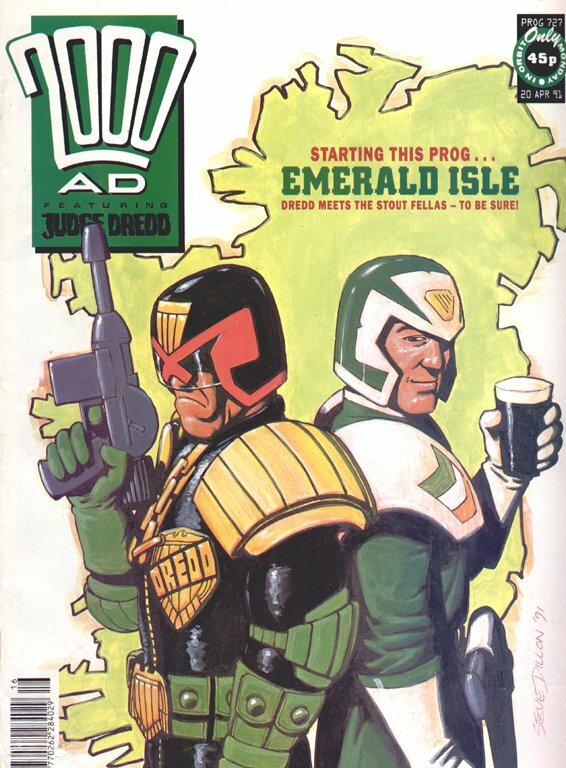 I'm not sure why: maybe Carlos Ezquerra needed more time to get "Al's Baby" off the ground over in the Megazine, but there had been plenty of earlier cases where one artist took over from another in the middle of a Dredd storyline, and none in which one Dredd story was actually interrupted by another. The first distinctly Ennis-ish story in here, though, is his second: "Emerald Isle," which I believe was the beginning of his very long-running association with artist Steve Dillon. The two of them clicked right from the start--this actually looks way more like the Ennis/Dillon Hellblazer or Preacher or Punisher than it looks like Dillon's earlier Dredd stories, even "Nightmares." The setting--which is both the ground-level let's-have-a-beer Ireland Ennis had grown up in and a this-time-it's-personal skewering of the fantastical, myth-loving Ireland he'd evidently had to grow up with--is a very clever contrast to the Big Meg; the scenes of people talking through their fumbling attempts to pursue their interests through violence were already becoming an Ennis hallmark. It's funny but effective that Ennis's Dredd always acts and talks exactly like Wagner's; here, especially, it's as if one writer's character has been dropped into another's entire world-view. Ennis gets the two longest stories in the 2000 AD portion of this volume, but Wagner's responsible for the rest. BARNEY indicates that "Bill Bailey, Won't You Please Come Home" had originally been written as a post-"Apocalypse War" story. That's possible (although Wagner is credited as sole writer; wouldn't it have been co-written by Wagner and Grant at that point? ), and indeed I don't think Necropolis is mentioned anywhere in the story as published--just that it's been nine years since the war. If it was indeed written at that time, though, I can see why it would've been canned: it goes on longer than its premise deserves, and Wagner and Grant wrote another a "soldier who thinks the war's still going on" story in that period anyway ("The Last Invader"). The episodes from the weekly here are bookended by Wagner and Ennis's takes on the same plot point: what exactly happened to Chief Judge Silver. In "Theatre of Death," Wagner (with returned prodigal artist Ron Smith, who wouldn't draw Dredd in 2000 AD again for another two years and wouldn't collaborate with Wagner again for nearly four) reintroduces a theme he'd touched on in the past and would come back to again later on: that a history written by its victors is a kind of heroic theater that may or may not have anything to do with the truth. "Was that how it happened?" Dredd wonders. Seven months later, in "Return of the King," Ennis answers: of course not. And in that story, Ennis dares to add a crucial piece of information to the Dredd canon. 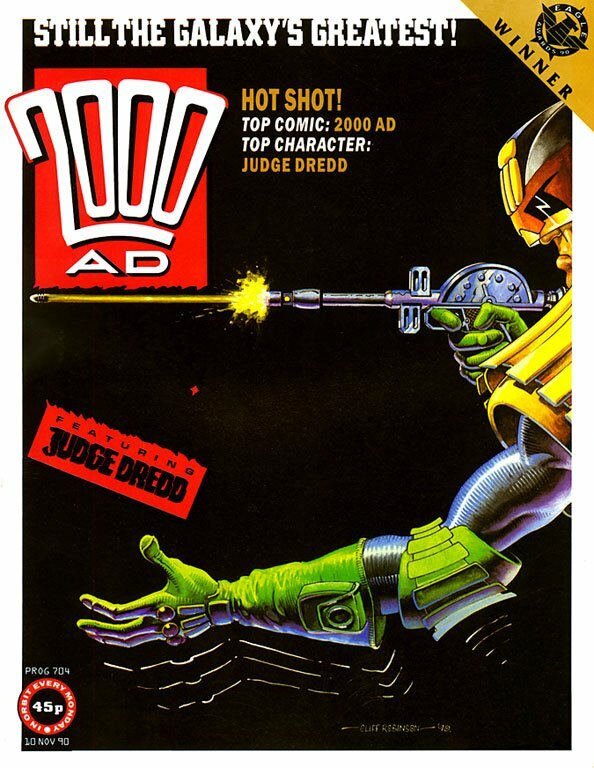 As of 2113, Hershey's been a Judge for twelve years (well, eleven, Wagner later indicated, but still), and Dredd's been one for 34 years--since 2079, in other words. That's actually the shortest possible amount of time he could have been a Judge. If Rico served twenty years on Titan and returned fourteen years ago, he didn't have much time to go crooked and get found out after he graduated from the Academy. In fact, Pat Mills later retconned "The Return of Rico" to have happened after "The Cursed Earth"--and therefore after "The Day the Law Died"--which gives the timeline a little bit more room to breathe. This volume seems to have an odd relationship to in-story time, in general: the opening panel of "The Apartment," from Prog 722, indicates that it's happening "over a year after the defeat of the Dark Judges," although it'd been only five months in publishing time. 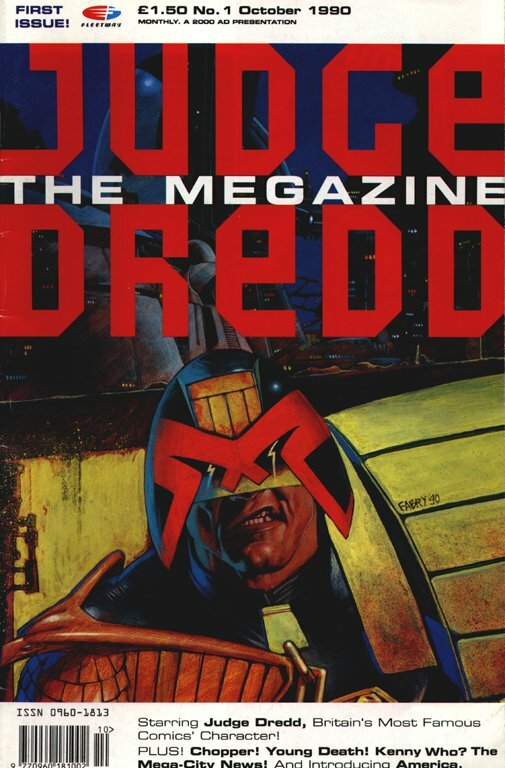 The other big news is the debut of Judge Dredd Megazine, which was monthly in the period covered here. There had been an earlier attempt to put together a spinoff series with stories set entirely in the Dredd universe (I believe "Helltrekkers" had originally been prepared for it), but it didn't get off the ground; this did, in style. 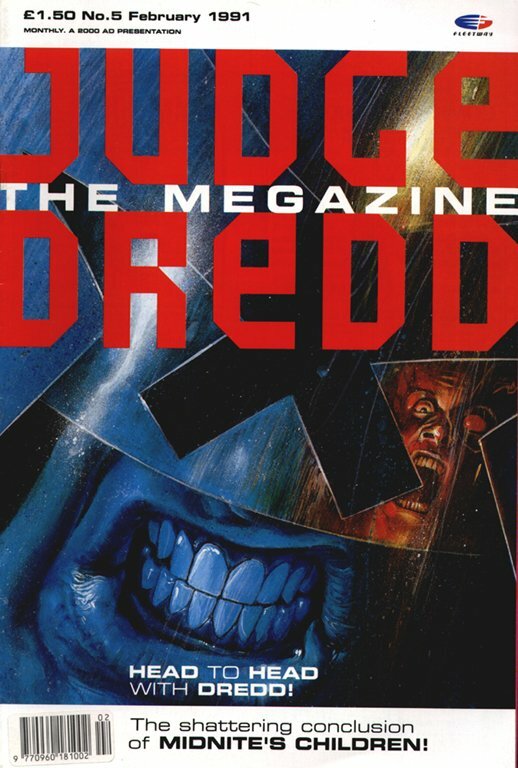 The first issue of the Megazine was cover-dated October 1990; Thrill-Power Overload indicates that it hit newsstands in the middle of September, meaning around the time of 2000 AD Prog 697 (which came with a Megazine poster). 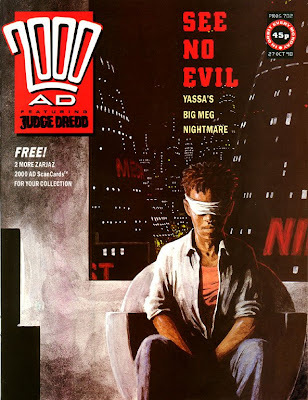 The lineup, in order of appearance, was Dredd in "Midnite's Children," the Garth Ennis/John McCrea Chopper serial "Earth, Wind & Fire" (which I covered a few weeks ago), a very filler-y text feature, "Brian Skuter" (Wagner) and Peter Doherty's "Young Death: Boyhood of a Superfiend," Wagner and Colin MacNeil's "America," and Wagner and Cam Kennedy's "Beyond Our Kenny." Not a bad group at all. Well, maybe aside from "Midnite's Children"--the fact that go-to speed demon Jim Baikie drew it suggests that it came together very quickly, and Alan Grant's story stumbles for a few chapters before it starts to make much sense. The rest of the Megazine stories included here aren't much better. Grant's two one-shots are exceptionally lightweight, and Wagner's "Black Widow" is a monster-in-human-form plot he's written before; in fact, it's very close to the original "Nosferatu" in some ways. Also, John Hicklenton's art for "Black Widow" is just awful. He was a terrific artist in the right contexts (I liked him on Nemesis), but anything approaching realism wasn't his strong point at this point, and not only do his lumpy, squished faces and figures pop me right out of the story, his layouts are so messy they make it hard to figure out what's going on most of the time. (I only know he drew this one because of BARNEY, thanks to a regrettable detail about the Complete Case Files' design: it doesn't indicate who wrote and drew which stories in the Megazine, in which the credits appeared on a contents or title page rather than on the story itself.) 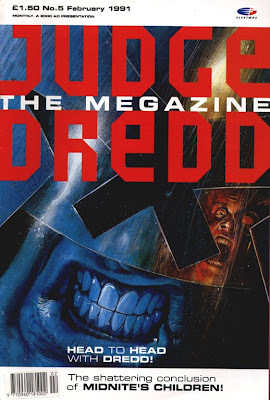 There was a lot of first-rate art in the early Megazine--I like the Duncan Fegredo cover below--although it might not have been the best design decision to have the logo occupy half the cover space. 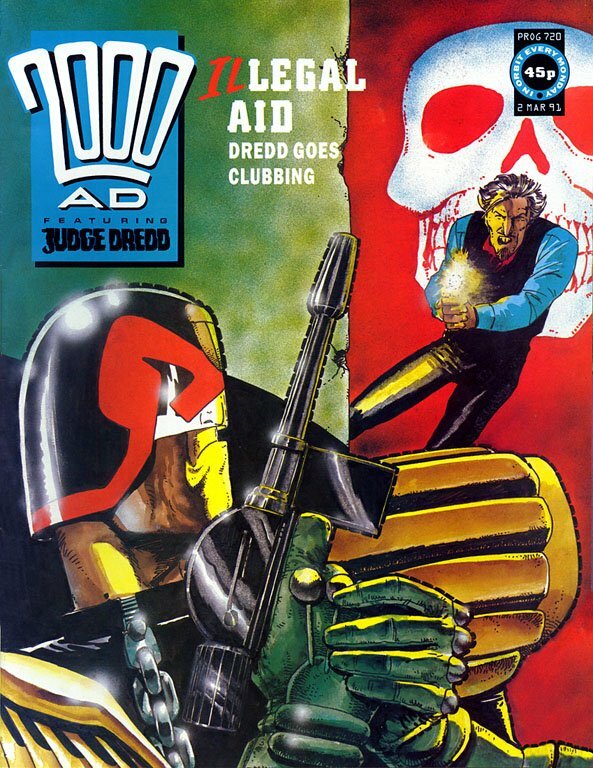 It's a little strange that even after Dredd got his own series with his name in the title, 2000 AD remained the place where his main in-continuity stories happened. Aside from crossovers with the weekly, the only major contributions to the megaplot that the Dredd stories proper (as opposed to spinoffs) in over 300 issues of the Megazine have made are Judge Beeny, Mechanismo, and arguably "The Three Amigos" and a couple of PJ Maybe appearances. Anybody want to argue differently? Bring it on in the comments section! Next week: the remarkable David Brothers joins me for a discussion of Judge Death: The Life and Death Of..., which encompasses the "Young Death" serial from the early Megazines, the Frazer Irving-drawn serials from the early 2000s, and more. I found this blog a few days ago and I just want to say it's a great read. 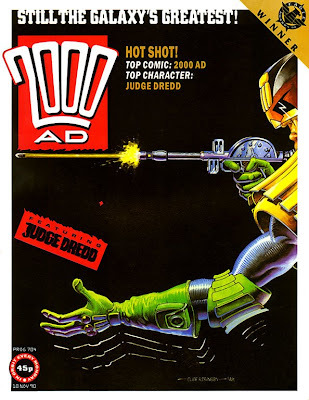 When I was a kid I picked up a few of the old Fleetway books in the US and liked them but somehow Dredd never made it onto my pull list. I'm fixing that now and have a groaning shelf full of Dredd case files and other collections. Wolk: "the only major contributions to the megaplot that the Dredd stories proper ... have made are Judge Beeny, Mechanismo, and arguably "The Three Amigos" ... Anybody want to argue differently?" What about anyone wanting to vociferously agree? 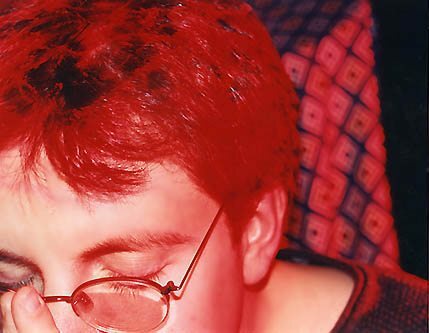 The period following The Megazine's initial run (and the corresponding years of the weekly) was characterized by a catastrophic conceptual weakness. I don't think anyone knew what it was for or what kind of material it should feature. At various points I've thought, 'Aha! The Meg's to be the Wagner & Grant Show, providing them with the creator-owned venue for their work they'd been looking for elsewhere', then 'Aha! The Meg's somewhere that can run more sophisticated stuff, allowing the weekly to target future generations of "bright, angry ten year-old boys"'; but I'm ultimately forced to conclude that it's just 2000adextra. Or, during the reprint era, 2000adPlusOne. Given the disparity between the circulations of those two publications, it wouldn't make a lot of sense to bury key developments where many readers wouldn't see them (or, if they were under 18, sometimes couldn't see them). Look at the outrage in The Nerve Centre when important events in Judgment Day were hidden behind the Pay Wall of The Meg; the result of which was the messy compromise of Wilderlands, where readers could rest assured that nothing important or exciting was happening in either comic. I don't think any of that means Dredd in The Meg's a waste of time, though. The Megaplot (useful concept, nice coinage) is great, but I'm sticking around for the gag material and inspired one-offs as much as for the grand arc that makes The Wire and The Sopranos look like teliological lightweights.